Inflation has been gradually decelerating since its peak in October 2017 of 2.9%. The slowdown in year-on-year inflation was mainly driven by a higher base from last year. Indeed, at the turn of 2016 and 2017, prices began to accelerate as a result of faster growth in food, fuel prices and higher prices at restaurants due to the introduction of the online registration of sales (electronic evidence of sales). Another reason behind the inflation slowdown has been a stronger CZK, which could have subtracted around 0.4ppt from YoY CPI growth already. The above-mentioned effect was foreseen and does not represent any major surprise. Despite that, inflation decelerated to 1.8% in February and ended below the market forecast of 2.0% and the CNB’s assumption of 2.2%. Looking at the CPI structure, however, the faster-than-expected deceleration was driven solely by lower-than-expected food prices. Indeed, food prices decelerated from 4.5% in January to 2.3% in February. This means that the contribution of food prices to YoY CPI growth fell from 0.8ppt in January to 0.4ppt in February. Deceleration was also seen in alcoholic beverages, whose contribution fell by 0.1ppt in February compared to January. As such, lower inflation was driven mainly by “supply” factors which should be less relevant from the monetary policy perspective. Prices of services grew by 2.4% YoY in February, despite the base effect pushing YoY dynamics lower. CPI growth should return to target in the next few months, though fuel and food prices are a source of uncertainty. Still, demand-driven inflation should remain strong this year due to solid household consumption supported by favourable wage dynamics. The latter accelerated by 8% YoY in nominal terms in the last quarter of 2017. Average wage growth reached 7% in 2017, the highest growth since 2008 when it reached 7.9%. Taking inflation into account, real wages grew by 4.4% YoY in 2017, representing the fastest growth since 2003. 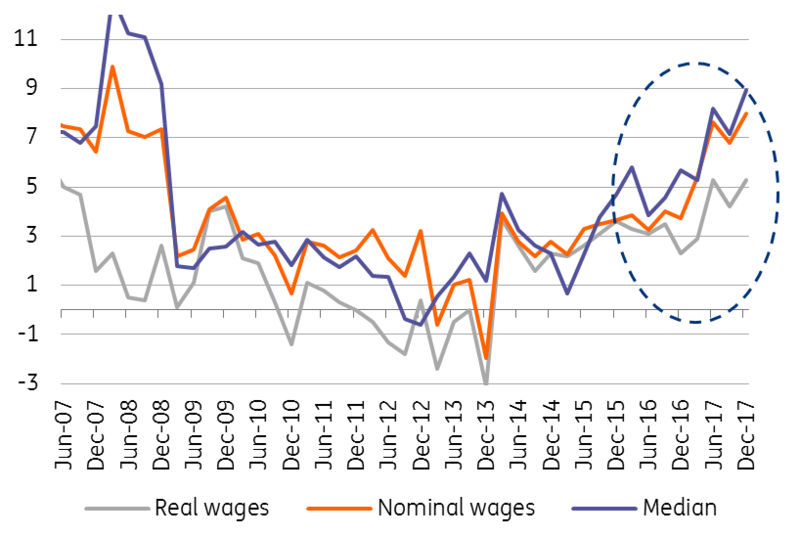 Moreover, we expect wage growth to accelerate further this year, close to 8%, as a result of an overheated labour market and pressure from unions. Strong household consumption amid positive developments in the labour market should provide support to inflation. Despite lower inflation in February, robust wage growth still provides room for two more hikes by the CNB this year, though they are more likely to be delivered in the second half.